Friendship Tails: The wonders of laser therapy! Friendship now has a therapeutic laser to provide our patients a noninvasive, drug-free treatment option for a variety of common medical conditions. This amazing little machine uses specific wavelengths of light to improve healing time, increase circulation, reduce pain, and decrease inflammation. During each painless treatment, the laser light interacts with tissues at the cellular level to increase metabolic activity within each cell. This initiates a cascade of beneficial effects that increases circulation, drawing water, oxygen, and nutrients to the damaged area. This creates an optimal healing environment that reduces inflammation, swelling, muscle spasms, stiffness, and pain. As the injured area returns to normal, function is restored and pain is relieved. 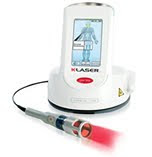 There are thousands of published studies demonstrating the clinical effectiveness of laser therapy. Among these, there are more than one hundred rigorously controlled, scientific studies that document the effectiveness of laser for many clinical conditions such as joint pain, hip dysplasia, swelling, ligament sprains, muscle strains, bite wounds, traumatic injuries, post-surgical pain and chronic wounds. The application of the laser is painless and quick with each treatment lasting about four minutes per site, no sedation necessary. The frequency and number of treatments required depends on the individual pet’s initial condition and response to therapy. We usually start off at two to three times weekly until we feel there has been a satisfactory improvement. After the initial treatment course, most pets will require maintenance treatments every one to three months to control pain. If you are still skeptical check back in on Thursday to read about Nietzsche’s story and how laser therapy has significantly improved his quality of life.